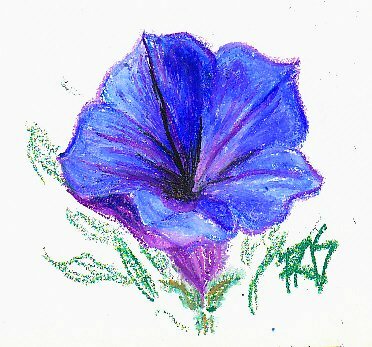 Blue Flower sketch by Robert A. Sloan in VanGogh oil pastels. 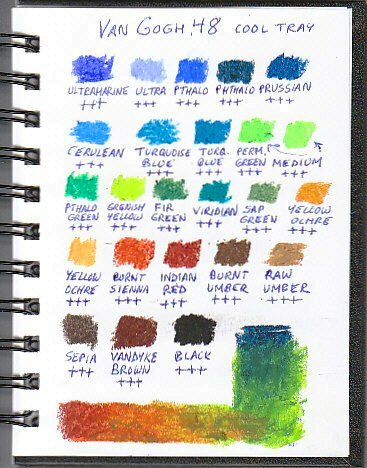 VanGogh Extra Fine Artists' oil pastels are listed as Student grade at Blick Art Materials but they may wind up being upgraded into Artist Grade after the lightfastness tests. The full range of 88 colors is available in open stock as well as sets from 12 to 48 colors. I bought the 48 color set but will be getting test strips from a friend who bought most of the other colors and may have all of them by April 15, 2009 when my independent testing begins. Texture is firm with a little less pigment saturation than Cray-Pas Specialist oil pastels. Color names are organized by pigment with many single-pigment colors although all are nontoxic. Tints of many of these colors are available and even in the 48 color chart I have a lot of good tints. Warm and cold versions of primary and secondary colors are included, sometimes with more than one tint for a popular hue. Each of the VanGogh sticks is marked ++ or +++ for lightfastness. I'm not sure which is higher as there was no context -- but it seems odd that while they don't claim lightfastness for this product, Talens does list it on each stick. I'll know what those designations mean in relation to the Blue Wool scale when I do my tests. Sticks are round and wrapped, good sized and the color range is harmonious with a nice assortment of familiar fine art earth tones at the end of the second tray. Pigments are listed on the wrappers as well as color name and tint by number. 5 numbers are the masstone, higher numbers are tints. On the color chart I didn't list the tint numbers but you can see easily where color names are duplicated. 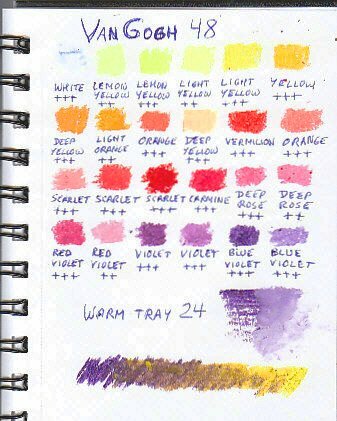 A good range of very light tints is excellent for nature and floral painting, plus the deep darks in violet, blue, green and earth tones help give a strong value range to the whole set. The 88 color range has still more tints and may have some shades or combination deep darks. Packaging is in a thin cardboard box with tuck flaps that contains two unprinted cardboard sleeves with heavy cardboard trays and white styrene inserts. A little inconvenient to pack up after a session but the two-tray organization makes a compact sturdy box to fit in a messenger bag or backpack. This is one set that wouldn't need a rubber band around it to survive carrying around, at least until the outside box wore out. Price is low mid-range for the entire range, a little over a dollar a stick in open stock while I paid $33 for the 48 color set. The set is a bargain in this brand, something I do check with most brands of oil pastels since it's good to have the box or tin to keep them in if it doesn't cost more. At the very least, VanGogh Extra Fine oil pastels are a quality student brand with the same pigments used in artist grade supplies and a good texture. Opacity is good especially in the white. I got a white highlight with a heavy stroke toward the middle of the blue flower and had to blend it down with more of the blue because I'd only intended to lighten. Here is the color chart for my 48 color range. Colors are as close as I was able to approximate them adjusting for the scan -- some light tints especially may be a bit off in hue.